The Mount Saint Mary Knights took on SUNY New Paltz on Tuesday, November 22, 2011 in the Kaplan Center in Newburgh, NY. 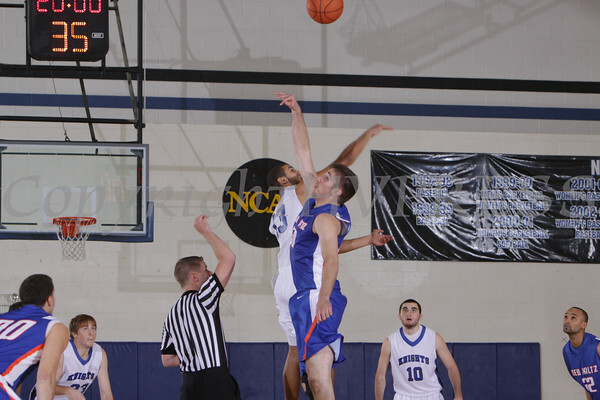 MSMC defeated SUNY New Paltz, 95-88 in the non-conference game. Mount Saint Mary F Carlos Valdez (13) wins the opening tip off against SUNY New Paltz on Tuesday, November 22, 2011 in the Kaplan Center in Newburgh, NY. MSMC defeated SUNY New Paltz, 95-88. Hudson Valley Press/CHUCK STEWART, JR.